At Turpin Meadow Ranch, we celebrate two seasons, aptly-named Green and White for the primary color of the landscape. 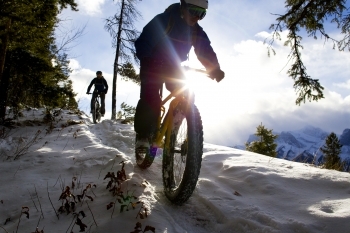 Although there are many fun and invigorating activities to enjoy at the ranch during the White season, one of the newer and popular sports is fat biking. The trails at Turpin Meadow Ranch were developed by ranch owners Hans and Nancy Johnstone, who are former Olympians, and were initially drawn to the area for the prospect of Nordic skiing. Snowmobiling, snowshoeing and fat biking are also popular choices on our 15 km of groomed Nordic ranch trails. The first time you saw a fat tire bike you may have been a bit startled and wondered why it had such large tires. It’s not just for looks. Those wheels with tubes and treads about two to three times the size of standard mountain bikes provide traction that takes riders places they couldn’t normally traverse, including wet stone, muddy paths or snowy hills. Fat tires are designed to ride at extremely low tire pressure, which allows for greater contact with the riding surface. 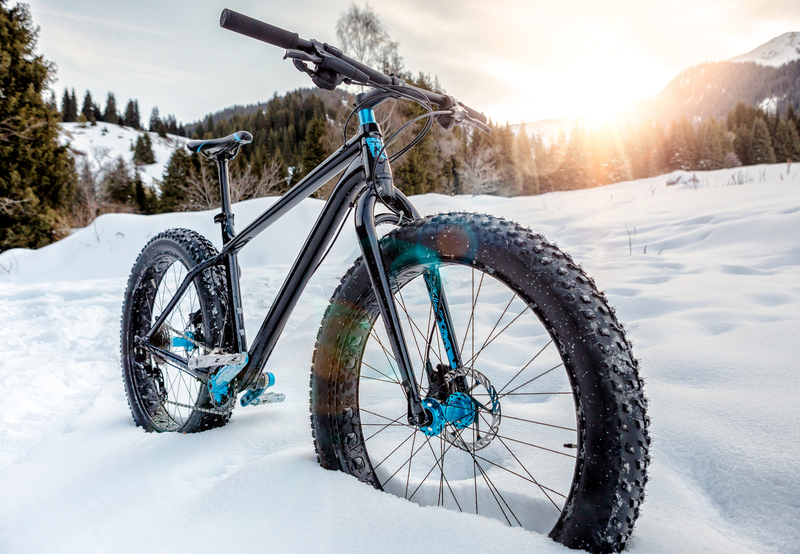 That’s why fat tires will get good traction even when the ground is covered in snow. Originally designed for riding in sand, fat bikes have evolved for off-road touring as well as groomed-trail riding in multiple seasons. Since the contact surface is wider, fat tires also provide better balance, which is great for both beginners and those riding somewhat slippery paths. The bigger tires also provide extra cushion, making it a comfortable ride. Fat bikes also take a little more effort to move than a regular bike, ensuring you’ll get a great workout while you ride. When you come to the ranch, we have many options for fat biking. Bring your own or rent ours for either a half or full day. We also provide guided tours, which is a great way to either get the ropes of fat biking, make sure you get to see specific scenery or wildlife, take the trails rated to your experience level, or all of the above. As far as clothing, your best bet will be to dress like you would for other outdoor winter sports. Waterproof outer layers are a great idea, including ski or snowboard pants. Keep in mind when planning inner layers that your core will heat up and you will get sweaty, which could quickly result in hypothermia in very low temperatures. Also, since it gets dark earlier in the winter, fat bikers frequently find themselves out after dark when temperatures rapidly drop. Lots of warm layers that can be adjusted is a good plan until you get a feel for what works best for you and your environment. A helmet is also recommended. For a few short rides, waterproof hiking boots should work, although you may need to loosen the ankles. Longer rides and more series winter bikers may want to consider investing in a good pair of winter riding shoes a size larger than normal to accommodate thick wool socks. Other riders use their summer biking shoes, but cover them with waterproof neoprene booties. Use fat bike gloves or two pair of gloves (one waterproof outer glove and one fleece, heat-retaining glove) to help keep your hands toasty. You may also find a moisture-wicking stocking cap that fits under your helmet will help keep your head comfortable. For your neck, face, and lower ears, a lightweight neck gaiter will keep cold wind away from your skin and help retain heat. Sunglasses or goggles will help prevent snow blindness and also help keep frigid air from stinging your eyes. 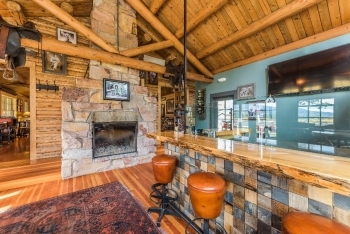 Once you’re done riding, retire to the lodge for a bit to eat and warm drinks by the fireplace. We’ve got a cozy bar for enjoying a warming beverage before, during or after your adventures. Overall, fat biking is a fun winter sport for biking enthusiasts wanting to explore our trails as well as less experienced bikers who want to take moderate tours of the countryside. It’s a great way to see nature and get exercise in winter. Ranch trails are available for lodging guests and to day visitors for a small fee. We hope to see you at the ranch during our White Season to check out all fat bikes have to offer.